The Striped Dog Polo in Blue Niagara and White by Doggie Design is a sporty look with their signature logo on the collar. This 100% cotton pique polo will be a great way to have your dog stand out. 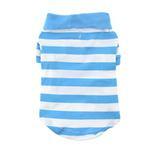 We love the soothing stripes of light blue and white of this classy dog polo. This pastel-colored polo would be a great choice for Easter, for birthday parties, or for attending baby showers. It would be a classy look on the golf course or at barbecues. Striped Dog Polo by Doggie Design - Blue Niagara and White Customer Photos - Send us your photo! LIL money out for a cool Saturday afternoon drive in his polo..
Dilly loves his classy polo shirt for summer get togethers!! Blue and Ridge enjoy sporting their blue and white striped polo to the golf course! Peyton is a 3 year old male Maltese who's hometown is Plano, Illinois He loves vanilla ice cream with sprinkles. Mr. Peyton is show casing a Blue Niagara and White Striped Polo Shirt by Doggie Design exclusively from Baxter Boo!! Baxter is 6 years old, he's 8 pounds of love. He loves to play and craves attention. Posted On 10/05/17 by juanita r from Plano, IL Yes, juanita r recommends this product! Absolutely love, love, love my pooche's Blue Niagara and White Striped Dog Polo Shirt!! Highly recommended!! And blue is his color!! Posted On 09/17/17 by Catherine T from Fort Mohave , AZ Yes, Catherine T recommends this product! Love all the variety of colors and perfect for my large dogs. These shirts are well made and very cute! I usually buy Doggie Design or Dogo products due to their top quality and will be adding Hawaiian Breeze to the list. You can't go wrong with any of the Baxter Boo items! Posted On 05/11/17 by Diyana C from Oakland, CA Yes, Diyana C recommends this product! Midas is choosing to keep it cool and preppy this summer with this look. He loves polo shirts and the light blue extenuates his coat. Posted On 04/11/17 by Marie S from Mount Kisco, NY Yes, Marie S recommends this product! Cute dog polo. Excellent quality and great price. Posted On 04/10/17 by Betty P from Bakersfield, CA Yes, Betty P recommends this product! Wore shirt - collar snapped up - with his new red visor and was one cool customer! Posted On 04/07/17 by Schuyler S from , FL Yes, Schuyler S recommends this product! I got 2 of these polo's for my dogs for Easter & they look so adorable I have to order them ones in other colors!! I bought 2 of these shirts for my boys & they look adorable!! I love Baxter Boo to outfit my Yorkie! Everyone at the dog park calls Aayden a little "fashion plate" because the clothes from Baxter Boo are so cute!